Who is the most important friend of Jesus in Mark’s Gospel? I am sure if you asked this question in your Bible Sharing group there would be many answers. My answer is, ‘YOU’. Having introduced Jesus and John, Mark turns his attention to us. “After John had been arrested, Jesus came to Galilee proclaiming the gospel of God: ‘This is the time of fulfillment. The kingdom of God is at hand. Repent, and believe the gospel.’ (1: 14-15) You and I are the only persons around to hear this most important message. Read it over and over. It is God’s message to you, today. Do not be overawed at the prospect. Along the way you are going to meet some quite interesting people who will give you a helping hand. One Sabbath day as Jesus was leaving the synagogue after the service Peter invited him to his home. Actually he was worried about this mother-in-law who was suffering from a fever. On reaching the house Jesus entered and cured here helping her to get up. We are told that the fever left her and then she ministered to them. She certainly did not make lunch, that was prepared sometime on Friday. A close reading of ministered, suggests, that she brought the Good News of Jesus teaching to her family and community – an apostle. While on a preaching tour of Galilee Jesus met a leper and cured him. Jesus said to him, “See that you tell no one, and go show yourself to the priest.” The encounter with Jesus must have been a memorable experience, so much so, that he could not stop talking about. Once more we meet an unlikely messenger of the Gospel. Jesus continues his journey through Galilee eventually coming back to the shore of the Sea of Galilee. He and his disciples cross the lake to the pagan side where they meet the Gerasene demoniac. Remember how Jesus drove out the demons which went charging into the sea and the man had his humanity restored for, he was sitting there clothed and in his right mind. (5: 15) Not surprisingly this person wanted to follow Jesus. However, Jesus had other plans for him. “Go home to your family and announce to them all that the Lord in his mercy has done for you.” He is the third person to take up the challenge to spread to Good News. Are Peter’s mother-in-law, the leper, the man from Gerasa, the twelve; such little people? 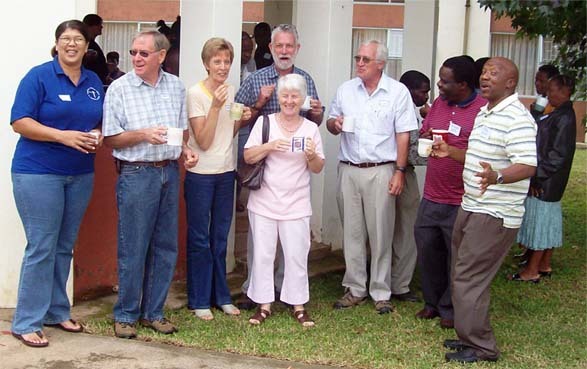 You may be able to identify Mary and many others in the photograph below.